Ma Griffe was launched in 1946 by the design house Carven. It was created by nose Jean Carles, who had apparently completely lost his sense of smell by that time (see Michael Edwards, Perfume Legends, p. 96). The fragrance notes are gardenia, greens, galbanum, citrus, aldehydes, clary sage, jasmine, rose, sandalwood, vetiver, orris, ylang ylang, styrax, oakmoss, cinnamon, musk, benzoin, and labdanum. Ma Griffe is classified as a floral chypre. The top notes are an aggressive burst of greens and citrus notes; there is a touch of gardenia, but very little sweetness. It settles into a mossy floral with a hint of spice and a musky base. It stays very green, but the hard edges dry down very soft and smooth. This is a nice scent, but it is not as edgy as I expected. In the early 1990s, Ma Griffe was "repositioned" and the price was lowered. I can only assume that the formula was reworked around the same time. I would love to know how close it is to the original scent, if you know, please comment! Ma Griffe can be found at bargain-basement prices online; a quick google search will turn up a 100 ml bottle for less than $20. The cheapest I've seen is a tester from scentiments for $12.84, but they are sold out at the moment. why review something so bad? If I could go on a time machine, it would be nice to visit a perfume counter in the 1950s and smell the original version of this scent and the other great chypres such as Coty's Chypre, Vent Vert, Cabochard, etc… I think the only great surviving chypre that's readily available and is more or less unchanged is Mitsouko. I've sniffed the eau de toilette of version of Ma Griffe when I see a tester from time to time. Ma Griffe gets an interesting mention in the Janet Fitch's novel White Oleander as it is the signature perfume of a stylish and sympathetic prostitute next door who befriends the young narrator and later gives her a bottle of Penhaligon's Victorian Posy. Whoa, that's an edgy print ad! You know for sure Ma Griffe isn't some vanilla-based, sunny and sweet scent! This is another fine review of one of the first scents I snuck from my aunt's dresser! I would love to be able to smell the original again. If they have to rework and update scents, why not rename them too, and leave the originals intact for us purists? BTW, Robin, I've been searching and searching for Muguet du Bois, but I can't find it anywhere! Want to see if that one is what I remember it to be. Avalon, I did not think it was so bad, actually I thought it was nice, just not really what I expected. But I also think it is worth reviewing any fragrance, good or bad! I will go on the time machine with you! I wonder what year Coty discontinued Chypre, and why on earth they don't bring it back — it is one of the most famous scents after all. Interesting, I don't think the current Ma Griffe is what I would pick if I was writing about a stylish & sympathetic prostitute, but offhand I'm not sure what would be a good fit. It is edgy…I love it! Karen, I'm assuming you mean searching for an “in person” tester, right? It is easily found online. Hi! White Oleander is a great book about the foster care system here in LA. As I recall, however, the prostitute that lived next door to the protagonist when she was in that lousy foster home in the San Fernando Valley gave her a bottle of Penhaligon's Love Potion No. 9. She described its bright pink color and how much she loved it. Then, through a series of events, the bottle got broken, a metaphor for her experience in foster care and the general state of her life. R, I remember that my fifth grade teacher, Mrs. Levin, wore this, and that our class gave her a bottle of it at the end of the school year or for the Holidays or something like that. I don't think it's as distinctive as Vent Vert or Cabochard, but was extremely popular back in the 50's and 60's. Thanks for your wonderful review! Hugs! R, Unless your 5th grade teacher Mrs Levin was edgy, maybe I just had the wrong idea about this fragrance all along. Would certainly agree that it is not as distinctive as Vent Vert. Going to work on the Gres fragrances next week, am trying to catch up with the classics here! This is so off-topic, but in 1995, Bergdorf Goodman actually sold a limited edition of Coty's Ambre Antique, and I think it is the best perfume I ever used – an oriental that's appropriate for day and night and used orange blossom the way Shalimar uses vanilla. I sprayed it on lavishly and then when I went back to get some more they didn't have any left, unfortunately. Once a year a bottle resurfaces on Ebay and sells for hundreds of dollars, and an eau de toilette version is sometimes available from a website called “Private Perfumery.” I suppose they got a limited license for the formula from Coty. Coty is now sadly such a down-market brand. Once again – you bring to life a long-forgotten fragrance (although many here seem familiar). You continue to be THE source for information and well thought-out opinions. Not sure I would enjoy Ma Griffe but now I am intrigued again to try Mitsouko. Again – thanks for such a great blog! I thought Love Potion No. 9 was a relatively new Penhaligon's scent which came out on or after WHITE OLEANDER was published. Now that you mention it, she didn't actually specify which Penhaligon's scent the prostitute gave her, but that it reminded her of the scent of an English garden and innocence, which could apply to Victorian Posy, Bluebell or the Elisabethan Rose, and of course, yes, when the bottle breaks, it serves as a metaphor for the elusiveness of innocence, a stable childhood, etc… I don't have the novel anymore, unfortunately, so I can't quote the package exactly. Too bad the filmed version of this novel, cut the prostitute character out entirely. She was my favorite adult character in the book. Wow, off topic maybe but a great story! I didn't know Coty did limited editions. Was this an old, reissued scent, or a one-shot deal? Thank you as always, Miss F! It seemed to me like a one-shot deal. I wrote to Private Perfumery last year and they said they were not going to make any more bottles of Ambre Antique, but were willing to sell the cologne version to me for $70 and the perfume for $300, which I did not take them up on. 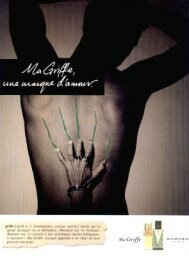 My husband was watching Japanese horror movies all weekend, so the ad for Ma Griffe, as you can imagine, gave me the heebie jeebies. Wow, not a cheap investment, especially for Coty. Tania, I was counting on you to appreciate this ad, LOL! But I can see the negative association. ma griffe seems to be a signature scent for lots of literary characters (i smell a dissertation topic. . .). from these characters, the name ma griffe is so familiar to me, though i've never smelled the perfume. thanks for the vivid description- – and by the way, i agree that it's worth reviewing any perfume good or bad. now as for chypres, my favorite has always been sisley's eau de soir. sister says it smells like hotel soap, but bah humbug. AND . . .as for the eerie ma griffe ad, you can take your mind off it by checking out the dishy creature for ormonde jayne's isfahan! lord almighty….. I wish someone would write a more general dissertation on perfume references in literature! Probably someone already has. And yes, he is dishy! Nobody is going to scratch green stripes into his back, LOL! The novelist who seems to be the biggest perfume fanatic is Ian Fleming. After he describes a femme fatale character's outfit, he sometimes mentions which Guerlain perfume they're wearing. The two I remember him citing are Liu and Ode, both discontinued. Proust, Baudelaire, Suskind and Colette are obviously interested in perfume but do not get that specific. Really, Ian Fleming! I'll have to check that out in the library. I just think there are alot of great fragrances to review. Coty discontinued Chypre at least twice. It disappeared first, I think, in the 70's, then came back for a few years in the 80's–I wasn't smart enough to stock up, and by the time I ran out, it was gone again…It is my favorite scent of all time, and I also wish they would bring it back. There was a thread on the Perfume of Life board recently…someone wrote to them asking if there were plans to bring it back; unfortunately the answer was no. I hear your pain re: Ambre Antique, having had a parallel experience myself (purchased at Neiman Marcus). I am grateful for your reference to Private Perfumery having a website now, however, as it is the company that actually created that reissue, under license to Coty. When AA disappeared from view, I tracked them down, and for my trouble got another bottle of the liquid gold, plus a copy of the ridiculously expensive coffee table book. I think they really took a bath on this, due to the down-grading of the once mighty name of Coty (and to think that Mme Guerlain wore Coty's fragrances rather than her husband's!). Apparently PP ran into formulating difficulties when attempting the next opus, which led to cost overruns and Coty pulling the plug on the whole sad, short-lived venture, but you've got to love whoever had the notion of recreating these legendary fragrances and giving them the treatment they deserved. Maybe they'll try again, who knows? It's a whole different market now. I always had a mental image of a warehouse somewhere just loaded with this stuff (I managed to score a couple more bottles on eBay years ago, before the $300/bottle days). I think whoever's got them now is thinking they're worth something as a collectable, hence the sky-high price, but I can't imagine why a remake of an old fragrance (sans Lalique bottle) would be worth anything to anyone. To have the fragrance again, though … ahhhhh. Just noticed this super old review, but had to reply. Ma griffe is one of the most brutally reviewed fragrances, and it is not deserved. I have a vintage bottle from the 50's, and the scent is pure magic. It does not have any of the harsh notes now associated with it, nor is it offensive. It is one of those fragrances that needed to be made from the same high quality raw materials it was created with, not all of the newer (cheaper) ingredients. I hope all of you will be as lucky as I was to find a glorious vintage bottle of the extrait, it is pure mana from heaven, It truly is on of the parfumeurs great creations, it just has not weathered the last half century too well; we can all thank corporate budget cuts for that. Please allow it another whiff, if you manage to find a vintage bottle, you will be pleasantly surprised. Didn't think my review was brutal in the least, but I'm sure you're right that the vintage is a huge improvement — it certainly is with almost every other perfume I've tried from that era. The first time I smelled this was 1970. I carried around my bottle of Ma Griffe for years with just a tad in the bottom of the bottle to remind me why I loved it. It was hard to find for awhile (for me). I am not an expert so while I also have an old old flacon of Ma Griffe, I don't find the scents THAT different. I did email the company in France when I was having trouble finding it late last year; they informed me they were revamping MaGriffe (the bottle) and aiming it back to the upscale market again. It is still supposed to be the original formula but now I wonder (from reading this posting) which year's original formula! I think Ma Griffe is one people either fall in love with or totally loathe immediately with no chance for changing one's mind in the future! Oh, that is great news, thanks! I used to wear both Ma Griffe and Vent Vert back in the late 60s – on me they dried down very green and fresh. Recently I came upon the reworked MaGriffe (I believe I found it @ Walgreens!) – it lacks a certain something now – maybe it's my body chemistry or maybe the reworked fragrance. I always preferred Vent Vert over MG, liking a really fresh, green fragrance. Interesting note on the White Oleander reference – my mother (an avowed Norrell user through her later years) hated Ma Griffe because her aunt owned a whorehouse and several of the ladies there wore a similar fragrance (this was in the early 1930s)! Art=Life, I guess! I'm thrilled to learn that Ma Griffe is returning to its original formulation. I'd worn this fragrance for 25+ years when it suddenly changed; it felt as though someone had taken away part of my identity. Fares Lahoud of Parfumelle suggested that it might have been reformulated only for the US market, and recommended that I contact Carven to find out. When I tried – but got no response – I asked a colleague in our Paris office to call them; still no luck. I finally emailed Selfridges in London, but they only had the new formulation. I tried everything, including eBay, where I found a few bottles of the original, but they were slightly “off” from exposure to air and light. Then my assistant returned from a trip to Hong Kong with a bottle of Ma Griffe for me; the packaging was ten years old and quite faded, but the fragrance was perfect. That's the last time I experienced the REAL Ma Griffe, and I miss it terribly. If anyone knows who owns the Carven Ma Griffe brand these days, please let me know. As soon as I can verify that the latest version is the real McCoy, I plan to send the CEO a dozen roses! Do you know if Ma Griffe has been restored to its original formulation yet? i feel exactly the same way….ive been wearing ma griffe since 1972…have watched it go through its reformulations. ive searched for anything current with the same scent, but no such luck. id give anything to be able to find the original scent in parfum, not eau de parfum. ive tried emailing carven in france, with no response. have you been able to get anywhere? I do not know who owns them. In the late 1990s/early 2000s, they were owned by Daniel Harlant, but don't know if they still are. Glad you were able to score a vintage bottle! I ordered this scent unsniffed, based only on its literary reputation (I am a huge fan of Fitch's novel). Honestly, I did not expect much, so I was pleasantly surprised to find a wearable scent, if a bit old-fashioned. It smells very familiar, although I don't believe I could have smelled it before, and it is so different from the popular generic scents today that it somehow makes me stand out. 3xasif — very late reply, but I don't know, sorry! Ma Griffe translates into “my claw”. My grandmother used to wear it and I always think of her and New York when I smell it. I keep several bottles in the fridge for summetime, actually ALL my perfume is kept in the fridge so I can keep it from disintergrating. It has the gardenia in it that I just LOVE along with the other green notes. That ad just knocks all this Tom Ford foolery to bits. A serious perfume. Leaving your mark upon a man – thnk of it! If only they would re-issue the perfumes for furs or perfumed lipsticks. Thanks for commenting. I'm still hoping they'll reissue this one in a better formulation. I just today got ahold of a vintage (1970s?) Parfum de Toilette. I was able to compare it arm-to -arm with a formulation that is a couple of years old. The differences are astounding, even when adjusting for the concentrations. The older version has lost some of the top note brightness, but more than makes up for itin the drydown-kind of salty, a little oily, and very green. It reminds me of salty skin, late afternoon at the beach, in the grass with sweet peas and beach sage. I think it will last into tomorrow, if not longer! Maybe this is an animal base quality? The newer formulation has a generic floral note in its place. It's longevity seems to be a mere few hours. I would be happy to send you a sample of the vintage if you like! Please keep me posted if you know of a newer formulation that may be closer to the original. Congrats on your find! I have sampled 2 vintage versions since writing the review, but I do thank you for your kind offer, and of course I'll post something if they do a newer version, assuming I find out about it! Has Ma Griffe been reformulated back to the original yet? They did repackage at Carven last year, so quite possibly MG was redone at that time. Have not tried it though. Will say that it is a million to one shot that they’d ever redo it in its original formulation — the most we can hope for is a “respectful” reformulation. The smell has definitley changed, its not as strong as it used to be. In fact my mum swears its been changed a couple of times as my mum has worn this perfume since the 50’s, she knows what she sniffing!! Its not as easy as it used to be to buy anymore, but if you hunt around you can get it. She has tried many a scent in the past but always comes back to this one. It may not be everyones cup of tea… but it makes me think of my mum when I smell it!! Oh yes, it has changed several times over. Still a great scent! Looking for Green florals, tried the vintage EDP version of this from TPC.com. Loved it! Very green, retro, bitter and gorgeous. Hope I can find a vintage FB! I read somewhere that Ma Griffe was Julia Child’s favorite perfume. It does seem like the perfect scent for her! It really does seem like an excellent fit. I just bought Ma Griffe on-line last week. I am really fond of the crispness of green scents- but this one has something so barnyard at the start of it that I don’t know if I can wear it…will continue trying as I hate to be a quitter! I finally purchased Ma Griffe again after several years trying other scents and being totally disappointed with them. I remember the 1970’s version of Ma Griffe very well. It was not like the others, it was light, fresh, with no heavy musky undertones. The fragrance I received does not remind me of that at all. There is no longer anything unique about this fragrance. It is still a light pleasant floral scent but it falls short of being what it once was.